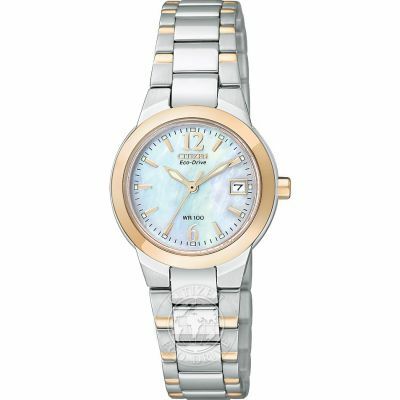 Understated ladies Citizen Eco-Drive watch in high-shine stainless steel, set around a white mother of pearl dial with date function and baton hour markers. Bought as a gift for my sister. Arrived gift wrapped as requested and looked so pretty I didn’t open to spoil it! Sister loves it. Great watch, does everything it says in the description. Value for money and looks good. 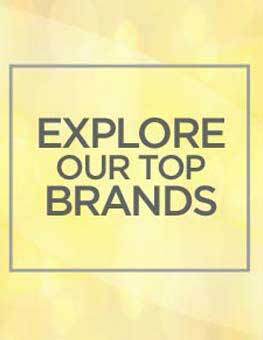 Brilliant product, well made,comfortable to wear and looks stylish. Watch face is easy to read but not too chunky and the mother of pearl finish is great. Really pleased with the watch and the links I asked to be removed were. Very prompt delivering the item and arrived before stated. Bought this for my partner for Christmas so still waiting to give it to her. This watch was purchased as a christmas gift for my wife. I was extremely pleased with the ordering process and speedy delivery to my chosen collection shop. Good looking product at reasonable price. Very prompt service delivered to point of collection in less than 5 days. Boxed and packaged ready to give. Just what I wanted. 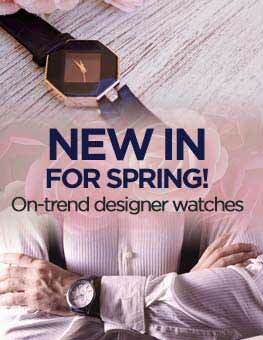 A lovely watch that can be worn any time. I ordered in on a Friday, it arrived Saturday and I had it sized at the local branch of Goldsmiths Monday. Lovely watch. Good service. What more can I want? I ordered this watch on Christmas Day after taking over 3 weeks to decide I wanted it and am very pleased that Ive got it. Its very sleek, stylish and very light to wear. The face on it isnt as blue as the picture but that being said in the light, it is pale blue and pink and looks stunning. So many people have commented how nice it is and I would recommend this to anyone. Great watch + excellent service = Very happy customer!!!!! Bought this for my wife, she absolutely loves it. The colour of the mother of pearl face and little gimmicks impressed her at first, such as charging with light, the water resistance and the fact it still keeps time when low on power. A little down the road and its just a reliable, solid watch. 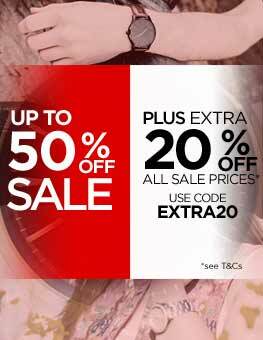 Would buy Citizen again, however I dont think it will need replacing in a long time. Realy pleased with my new watch. Have been looking for something similar for several years but have always been put off by gold and sparkles. Face a lovely subtle mother of pearl- mine not as blue as the picture. Face is a good size and compliments anything that choose to wear. 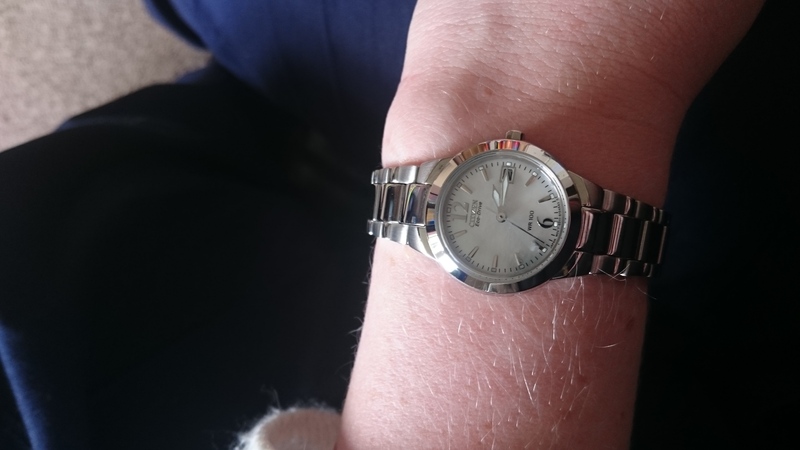 Band light, comfortable and easily adjusted by a local jeweller for my small wrist, however as the hinge mechanisim is quite long it now sits off centre on the underside of my arm possible that this could be remedied by strap being adjusted slightly differently. 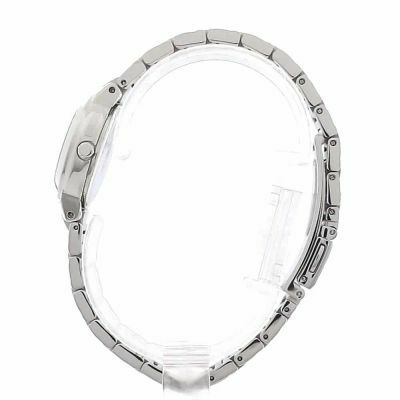 No issues with casing or strap material as is stainless steel and has not caused allergic reaction that I get from many metals. Like that the strap is polishes stainless in the centre and brushed on the edges- creating a two tone appearance. Catch is simple to operate as has buttons on the side to release, so is easy to take on and off, required in my job. Markings on face clear and hands and hours marked in luminous blue in the dark. Has date display on face but this is fiddly to adjust and took a little patience. Would not hesitate to recommend this watch. Beautiful watch. Strap is a little on the chunky side so it may not suit really small wrists, but for me is fine. 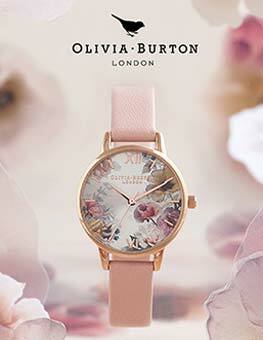 The mother of pearl face is stylish and extremely pretty giving this watch a feminine feel/look. The strap was on the big side so you will have to go to the jewellers to get it altered. Very pleasing watch, and most importantly so far has kept perfect time! Great looking watch, although the dial is more neutral than the blue shown in the picture. The strap was quick to get altered to size to get a good fit. If you register the watch with citizen you get an extra year on their warranty so its covered for six years which is fab. Great quality. Lovely watch, great price and fast delivery. The mother of pearl face has nice colours within in. Suitable for casual or dress wear. Item was easily trackable throughout the order. Id been contemplating an ecodrive for some time and purchased this with money received for my birthday. Its better looking than the picture, I just love it! I like this style of watch and have got a similar one not Citizen. Its a nice size, love the mother of pearl face, it makes it more feminine. No problem with illuminated hands, they are easy to see. Bracelet is both polished and matt which makes it distinctive. I did give my wrist measurement as I thought an extra link may be needed. Not sure if this was fitted but I will need to have one removed as the bracelet is just a wee bit too big. Ordered Sat collected Mon, great service, super product I am really pleased with my purchase. Not used watch yet as present for the wife. I have had a Citizen Eco-Drive watch for the past nine years and worn it on a daily basis. It has survived a very physical work life and also the joys of hobbies such as gardening and DIY. 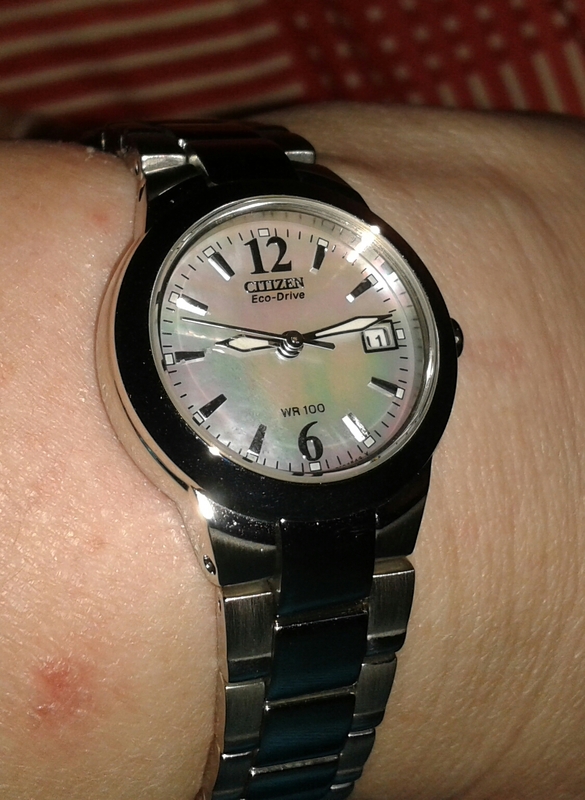 So when I decided to get a new one, it had to be a Citizen Eco-Drive. On first opening the box of my new watch, the first thing that strikes you is the very clear face, which is also a very feminine mother-of-pearl. The date and time was very easy to set. The hands glow in the dark which was very useful in the cinema! The watch says that its WR100. I have worn it in the bath, washed dishes and its also had a dip in the fish pond and there are no problems there. In fact there is nothing about it I dont like. Very happy with this watch and I feel it will fit in with any outfit I choose to wear or any occasion. So far, I cant recommend it enough. I bought this watch with bday money as wanted a watch that did not need a battery. Im extremely impressed with the whole eco drive & how it works. It looks fabulous & people have commented on how pretty the mother of pearl face is. I had 2 links removed from wrist strap & I dont have a tiny wrist, so definitely a plus as some straps are small. 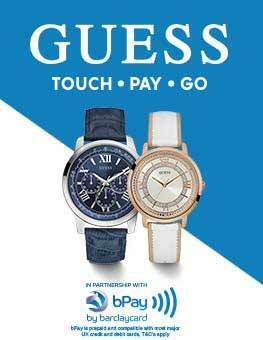 Apart from loving the style of watch, I think another big bonus is a 5 year warranty, what more could a girl want. The only negative I have found is the date has not changed itself since setting it but have only worn it twice so will wait & see if that corrects itself. You could wear this watch everyday or for special occassions. Im very happy with purchase. Nice clean look. No need for batteries. Im pleased wearing and using this as my daily and only watch. Lovely watch and very comfortable on your wrist. I really like the mother of peral in the watch facing. I had a bad service with this company. The watch is not too thin and small. It sits on the wrist comfortably. It's smooth to touch. Washing hands with it on does not seem to be a problem. Think this will last a few years use as it seems durable. good quality watch with a nice mother of pearl face Impressed with the eco-drive feature.